As a worldwide architectural discussion evolves into an earth-conscious — now labeled as sustainable– architecture focused primarily on the use of recycled materials and recuperating a few passive solar principles from the 70’s, “Thresholds” seems stronger and more coherent to the times in which we struggle to push back a building culture that brings a considerable amount of waste and contamination; a concerning matter that just a few years back was not so hard to predict. The study-exhibit Thresholds was about transformation and evolution, it rejected the idea of destruction or replacement as a consequence of a weak and inflexible architectural program. The following is the original text included in the Thresholds exhibition which took place in New York in 2001. 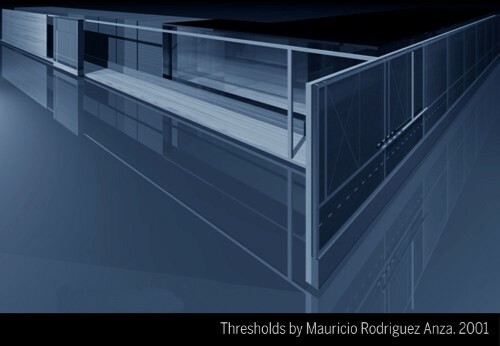 Thresholds would be the last of a series of architectural studies focused in architectural versatility by Mauricio Rodriguez Anza. The series (initiated with “Reconfiguracion” in 1996), would try to explore how architecture could overpass the concept of transience. The exhibit included the first proposed prototypes in which the conventional architectural body is fragmented in two, replacing the façade with an interchangeable format. The text was originally published in Geocities just after the exhibit opened in 2001 and was widely visited until it was shut down in 2009. This site will publish both design and architectural work derived from the Thresholds principles and will try to establish a new and rational perspective on how to qualify buildings by their adaptation capabilities. glass box in Barcelona, where structure and frame are evident features, both within and without while remaining autonomous from the rest of the quarters. He perceives that this idea also has ancient roots in the architecture of the Maya, specifically in the layered construction of the square known as the Nun’s Quadrangle in Uxmal, where facades were designed as separate units from the underlying building. Each structure in Rodríguez Anza’s current exhibit Thresholds is set on spare, broad, deserted spaces evokes Richard Diebenkorn’s formscapes or Gunther Gerzso’s abstract, geometric landscapes. The architectural renderings in this exhibition have to do mostly with syntax and structure, basic two-dimensional graphics, where color provides a vocabulary substituting decorative motifs. 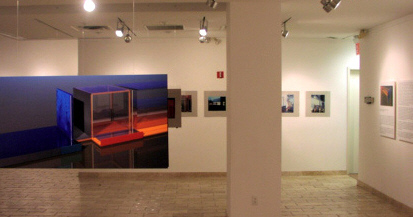 The idiosyncratic quality of Rodriguez Anza’s approach arises from several formative sources, which include the influences assimilated during his years as a furniture designer and his immersion in the works of Mexican masters Luis Barragán, Mathias Goeritz and muralist David A. Siqueiros, which complemented his studies of the Mayan Puuc style and the classic period of Olmec architecture. Among the first important strides he took toward the development of his personal aesthetic was a series of cabinets, in which a less is more approach was applied to the exterior panels and doors. These understated pieces rigorously respond to a bare aesthetic in which Rodriguez Anza achieves an intimation of towers of Miesian grandeur. The finish of the red cedar-wood doors was decorated by a row of circle inlays underlining the door top and center jam, in accordance to Mayan observance of the principle of symmetry. During the early 90’s Rodriguez Anza’s approached the chair problem through this emerging architectural synthesis, resulting in chairs as studies in form and structure. Combining slightly contorted polished mahogany backs, with black leather linings, armrests made of smoked steel and Corbusian stilts as legs, the overall achievement were light, simple self-evident structures, imbued with sobriety notwithstanding his use of primary colors accents. Interestingly the latest architectonic renditions seem to borrow from the experiences in furniture design, taking the solutions to sublime levels of simplicity. As Barragán, master of integration of the archaic and the popular forms with the modern program, Rodriguez Anza has sought architectural solutions that turn the public building into a visual landmark compatible with the most basic of visual forms: the line, the square, the triangle, and their Pythagorean evolutions: the cube and the prism. In his process of assimilation of different modes -from the Bauhaus style of the German émigré Mathias Goeritz to the minimalists such as Richard Meier- Rodriguez Anza has developed a personal style which focuses on the façade as a discrete problem on its own. The development of his façade syntax began in 1994 when he was commissioned to design a wall wrapping for the lobby of an office building in Mexico City: this became known as Installation America, a permanent structure which embraces three elevator cars and isolates them from the building’s adjacent glass façade. It was then that Rodriguez Anza realized the creative potential of designing structures detached from the rest of the architectural program. As with his furniture, this 45 foot-high half-cylinder proposal projected an imposing autonomy. The design called for the use of light-gauge steel sheet metal, affixed with disks and ribs, creating the sense of an aircraft fuselage in a futuristic movie set, finely crafted and oddly enough massive and protective like a pre-historic monolith. Contrary the trends of Le Corbusier, Rodriguez Anza has left nothing to whim. The use of Cartesian coordinates, the linear development of the surfaces and volumes of tectonic masses reveals a cold rationality. The rendering of these frames and structures, a complex of mitres and arrises, endow the unit with a fleeting, tenuous reality, an ethereal weightlessness and transparency. These characteristics constitute Rodriguez Anza’s core interests: the spiritual and emblematic and associative matrix he aspires to in public building design. Nonetheless there’s a pragmatic interpretation of his detachment of façade from the program. According to Rodríguez Anza with time, changes in urban design, building use and remodeling demands of pre-standing structures, the schism he proposes between façade and building would allow for a high degree of adaptability. By 1998 he had focused completely on the development of formal codes to generate adaptable architectural bodies. These included the integration of structural and visual elements -a principle first applied in Mexican architecture in the late 50’s, in a way that makes it hard to tell whether one is looking at a sculpture, a site installation, or an architectural rendition. The results of this particular mode were exhibited in Ex-Teresa, a center for alternative art, located in a XVII century church in downtown Mexico City. The modules created for the Ex-Teresa show, entitled Summons (1998), gave the impression of independent modules or formats which can be added on or interchanged to allow for an endless organic interplay of forms. The openings in the structures, and the transparency of glass, provided an elegant solution for protecting and highlighting previously built edifices and façades, creating the visual equivalent of a fusion between the grave, deep, sounds and slow rhythms of centuries old architecture and the bright, light and crisp melodies of Rodriguez Anza’s lanthorn-like cases. Summons defined and explored in depth the syntax of his proposal. Multiplicity and adaptability marked the plan for Rodriguez Anza’s architecture. 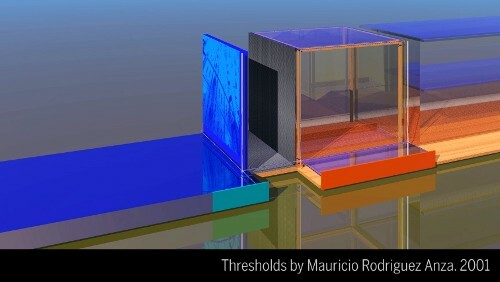 If the pre-Hispanic temples had used the growing concept in their pyramids, by adding new layers of rock onto the existing structure, thus making a heavy structure grow in prominence and complexity, he would find the way to build on previously standing structures, but, and this is his personal approach, his proposal would be free standing, translucent, light weight, yet resistant and colorful in its own way. From here on two paradigms would emerge in his work: 1) to avoid masking the program of architecture by merely creating a decoration unrelated to the substance of the building, and 2), to regard the whole façade and structure as a replica of the social body, formed by different layers, stories, counterpoints, frames of mind, and purposes. These paradigms are brought into existence as both light and matter, each in its own right yet inseparable from the composition. A new visual vocabulary based on the proposed use of hi-tech materials, such as colored glass, wire tensors, and other super light weight materials of enormous resilience, underpin the digital drawings in the exhibition of a concentrated experience of light. Given that the opaque forms are minimized while the transparent are maximized, exactly the opposite of traditional architecture, these renditions make one appreciate the natural transition between inside-outside space, between the private and public realms. Nature and culture have found a way of coexisting without any barriers in between, perhaps the same dream that inspired Frank Lloyd Wright to create his utopian dwelling Fallingwater over a streambed. While utopianism has inspired much of the 20th century architecture, Rodriguez Anza’s architecture is taking the dream down into the urban and suburban environments of the present time. Transposing his modular concept into the urban landscape would reinforce the coherence between the city and the façade gridworks, softening the hard-edged, urban design with a growing environmentally sensitive architecture. 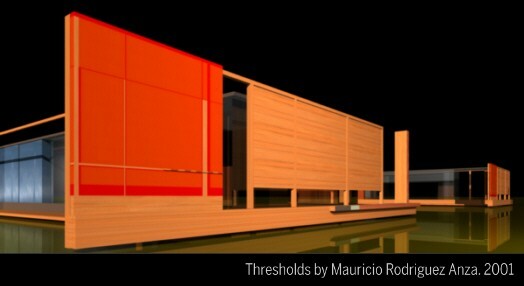 The “expandable building”, as Rodriguez Anza has baptized his concept, offers several advantages for new developments. The first one being the independent evolution of its components, which grow longitudinally adapting the structure horizontally, thereby lessening the stress on the materials and the structure. In some cases the structure seems to hover just above the ground, harboring the expectation that it might inadvertently levitate. The chance for adapting to different programs allows for a constant integration into the existing space. Rodriguez Anza’s speculative renditions, both on paper and in models, arrive at a basic geometric module, a box made of cutting edge materials. His reductive esthetic, inspired in abstraction, is the starting point for his development of a way of understanding architecture as a two-sided problem. The rigid geometry of the linear module has become a self-imposed, like the pentagram, on which he can play infinite themes. While some of his predecessors heralded the age of revival of decoration, Rodriguez Anza uses the industrial products in a classical, orderly grid, all the while rejecting adornment and symbolism. Art, architecture and design come together in these ideal works. And they do so by both adapting to vernacular buildings as facades or by proposing entirely new structures. His work is underpinned by a principle, that which states that the roof above man’s head doesn’t have to be encasing, but open to the environment, nature, space and, most importantly, time. A renewed vocabulary, full of color and transparencies, implies that architecture is as elastic as sculpture, painting and music; architecture integrates all these into one. In the 21st century architecture exhibitions are framed for their subversions and or extensions of the tradition of that particular event. In “Thresholds”, an exhibit where the frame of architecture is exposed, reconstituted and redefined, the question becomes; what do we expect out of this operation? The answers are multiple and complex, first the frame can become an instrument of connectivity to operate within the architectural image recognizing the importance not only of the materiality and tectonics but offers the possibility of establishing a system of views and spatial extensions into the landscape or territorial image. The where and when architecture starts and territory begins is dissolved. It is within this connection of images that the series of “Thresholds” become crucial moments as far as offering the possibility of a new perception, specially by the way Mauricio Rodríguez Anza has documented his work, as moments of a larger system, which has nothing to do with image as style but as the dialogue between the idea of interiority and exteriority and the importance of this moments in space and time. At this instance is where the intellect can join two worlds what was left behind and what is about to be entered, always with the potential for an argument of reflection, speculation or sequence. “Thresholds” is not only concern with fundamental questions of architecture. But on another level this work outlines the possibility of the future of the architectural practice, as a systemic application of the frame in several instances not only technologically speaking, but in terms of engaging all kinds of programs whose events could be coded with different material and tectonic applications. The enormous importance of Mauricio Rodríguez Anza’s work is not only because some kind of extension within the precedents of modernity, whether Mies or Barragán, but moves forward to the exploration and the investigation of architecture as an act of intelligence.